In between visiting Out on a Limb and the Summer Palace at the Morris Arboretum two weekends ago, I spent some time in the Rose Garden. Given the lateness of the summer and the horribly high temperatures the Eastern Seaboard experienced this year, I didn’t expect it to look like much. Fortunately, I was wrong. OK, I have to admit that the roses weren’t prolifically blooming, but they had been carefully deadheaded and here and there beautiful flowers caught my eye. 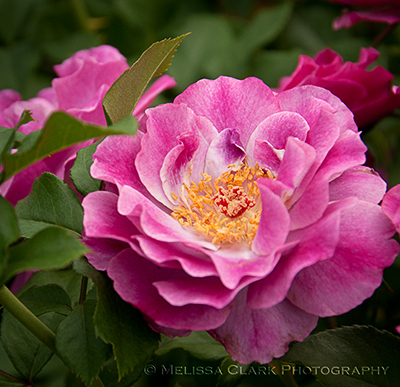 I’m usually not one for multi-colored roses, but the grandiflora rose ‘Wild Blue Yonder’ shown above was quite eye-catching, with hints of blue in some of the older blossoms. I have a soft spot for grandifloras since they bloom for such a long period, even if their individual blossoms aren’t huge. 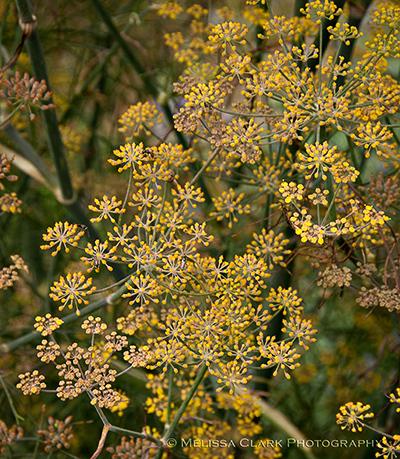 but my eyes kept returning to fennel plants in flower, rising up around Cotinus branches whose dark color provided the perfect foil to the golden and gold-brown tones of the fennel. 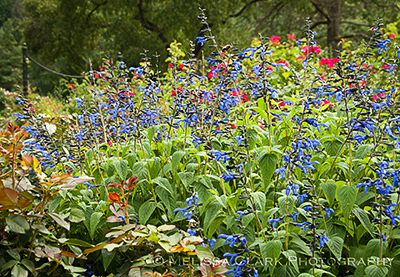 In addition to the fennel, there was a great blue salvia in bloom. 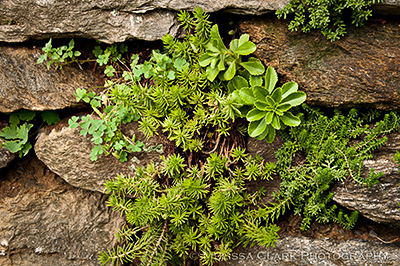 In the nooks and crannies of the stone walls at the entrance to the garden were sedums and other rock-garden types of plants, softening the stone and giving visitors more details to notice. The overall views were pretty impressive. 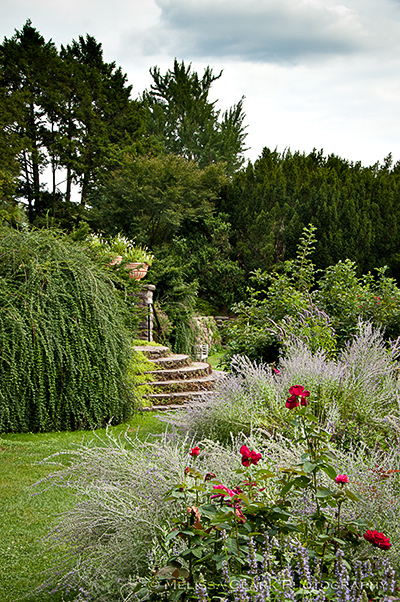 The entry steps to the Rose Garden, flanked by stone retaining walls, with Perovskia and red roses in the foreground. 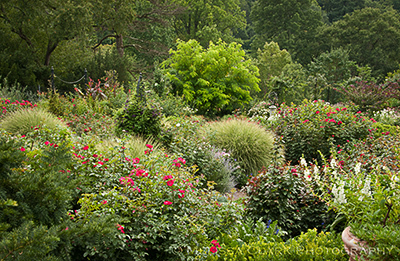 The "wide" view, with grasses, perennials and roses still going strong. 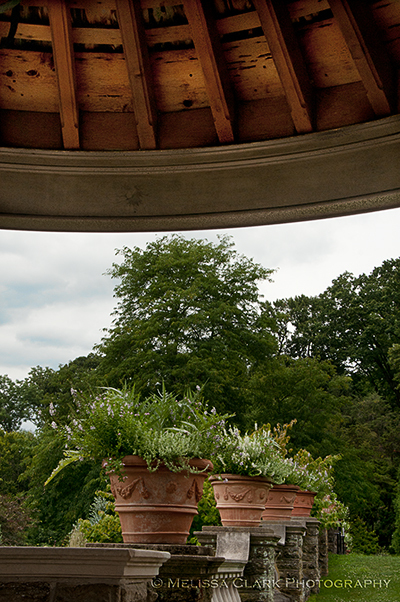 At the rear of the garden, tucked away in a corner, there was a small gazebo, through which you could admire the stone pots planted with simple white annuals, which helped define the boundaries of the garden. Note the beautifully-carved wooden ceiling of the gazebo. Another unexpected treasure for the observant visitor! 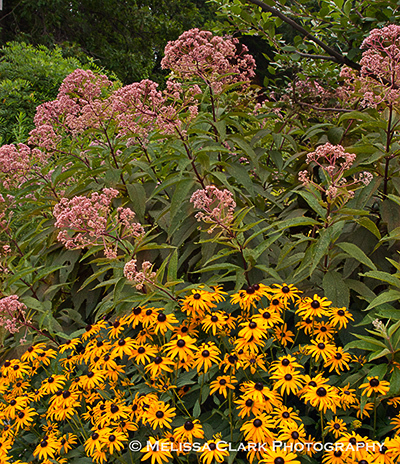 After the Rose Garden, I headed on to Chanticleer, where I spent a number of hours that evening and the next morning taking in its own special summer beauties. 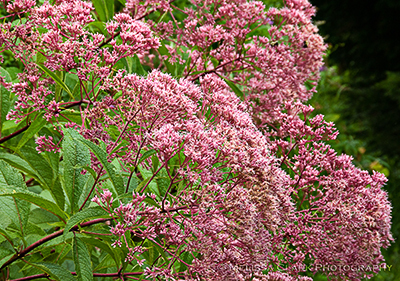 Soon, a post on that – but this weekend I’m in Connecticut to see some Open Days gardens in Litchfield County, so I’m not sure which I’ll write about next! Last weekend, I took a whirlwind trip up to the Philadelphia area, camera in hand. 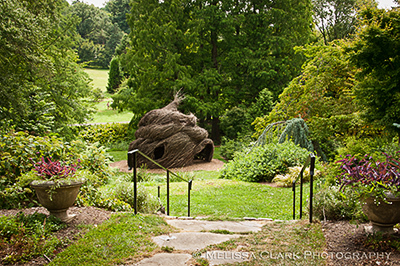 Although my primary destination was Chanticleer Garden, I decided to stop in at The Morris Arboretum, the University of Pennsylvania’s 92-acre playground. Unfortunately for me, Friday afternoon traffic being what it was, I arrived at the Arboretum with less than 90 minutes to spare before closing time (4 pm during the week, for those of you who might be thinking of going for a visit). Plopping down my $14 admission fee (yikes! ), I decided to limit myself to the Rose Garden, hoping for photo ops despite the heat and lateness of the season. On either side of the Rose Garden, however, I stumbled across two delightful locations/installations that were attracting children even this late in the day. (OK, adults too, just not those hell-bent on photographic pursuits). 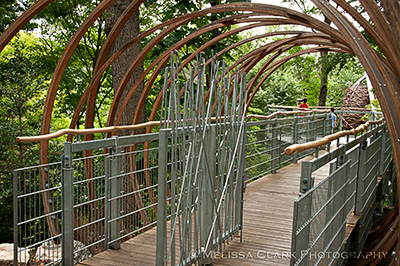 The first was called “Out on a Limb.” The exhibit consists of a 450-foot long walkway suspended 50 feet above the Arboretum floor. 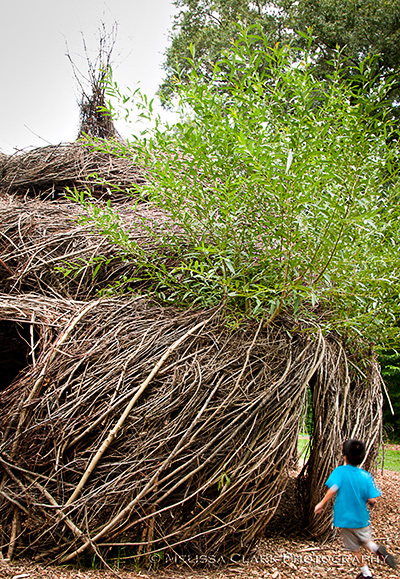 This permanent installation is part of the Arboretum’s Tree Adventure exhibit and was recently voted “Best Stroll Through A Forest” in Philadelphia Magazine’s 2010 contest. For a more detailed description of the exhibit and its design, click here. I was tempted to explore, but mindful of the ticking clock, I pressed on (this is a permanent exhibit, thankfully). The Rose Garden awaited. And it was beautiful – but I will save those photos for another post, lest I squander all my images here. Beyond the Rose Garden, one enters the Wisteria Walk, where a memorial bench is inscribed with the words “Honoring John J. Gatti, a man who was beauty and perfection as is this garden.” What an epitaph (note to sons: remember this)! 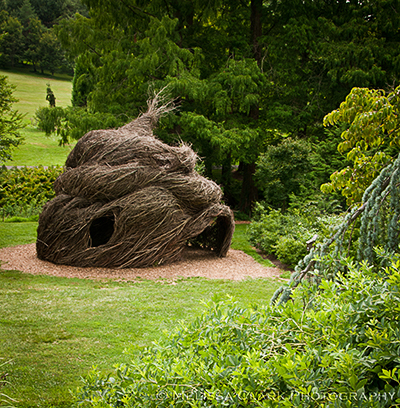 It was the “Summer Palace,” a structure of branches and twigs created by Patrick Dougherty. At least some of the branches must be willow, because as I rounded the corner to look at the palace from the rear, I saw a wonderful set of leaves sprouting from the top. A willow branch, leafed out, rises above a small visitor to the Summer Palace. A group of children was darting in and out of the place, hiding from each other and their mothers in its maze-like interior. One of the moms, responding to my questions, said that the Summer Palace is a permanent part of the Arboretum; Dougherty keeps tabs on it and repairs bits of it as needed. It must look awesome in snow. 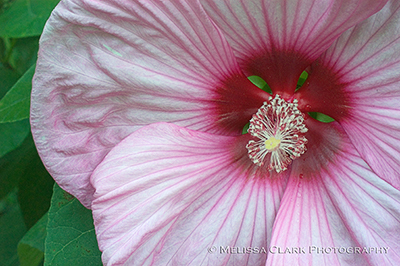 So if you have children and are within driving distance of Philadelphia, or are visiting the area, don’t miss the Morris Arboretum. I’m sure there are many more areas to explore for the younger set – this visit was a revelation to me and I encourage you to put it on your list! 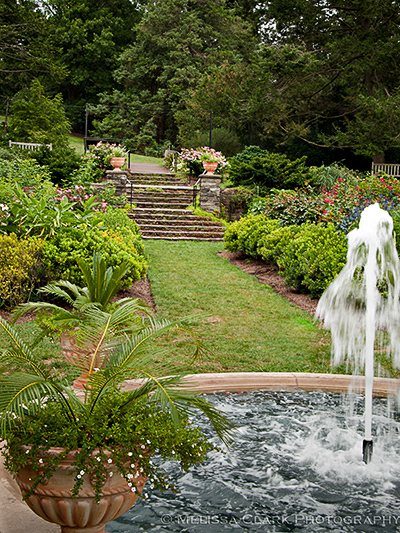 For more information on the Morris Arboretum, including its hours, visitor programs and volunteer opportunities, visit its website. Next week: a peek at the Rose Garden. 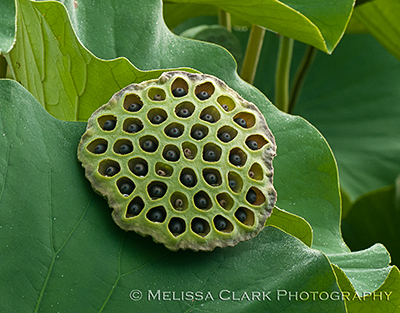 Once fully open, their seed heads are bright yellow with tiny hairs that attract bees and other insects almost constantly. 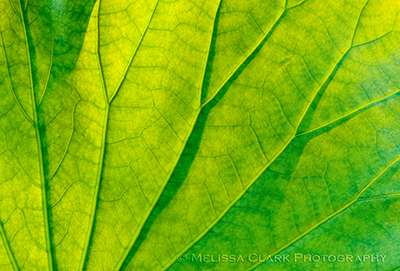 To get a shot without insects crawling all over them takes patience (often in blazing sun). 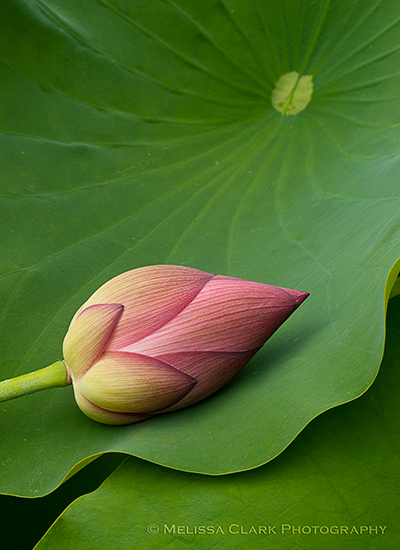 These exotic, luscious flowers need a “bed” such as a pond or other water body and three months of temperatures averaging 75 to 85 degrees Fahrenheit to bloom. All of the photos above were taken at Kenilworth Aquatic Gardens in Washington DC during two field trips with my camera club in different summers. 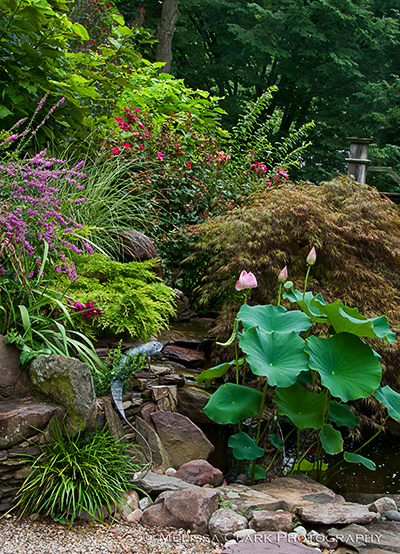 The other place I have seen them en masse is at Chanticleer, in the Pond Garden. 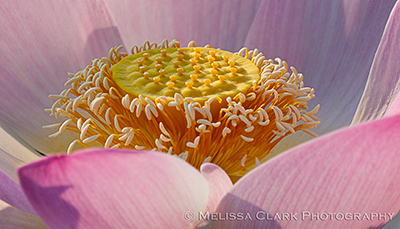 But a couple of weeks ago, shooting a garden that will be on September’s Open Days tour here in Washington, I encountered a beautifully designed back yard setting where the lotus’ color and its leaf size and shape had been used perfectly. 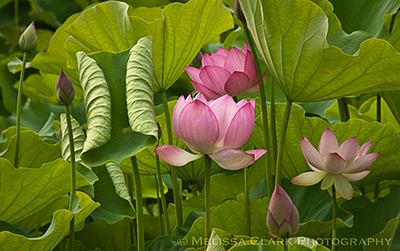 Here, the huge leaves of the lotus provide a wonderful foil for the delicate foliage of the dissected maple behind it and the airy, spiky shapes of the other plants in the left of the composition. 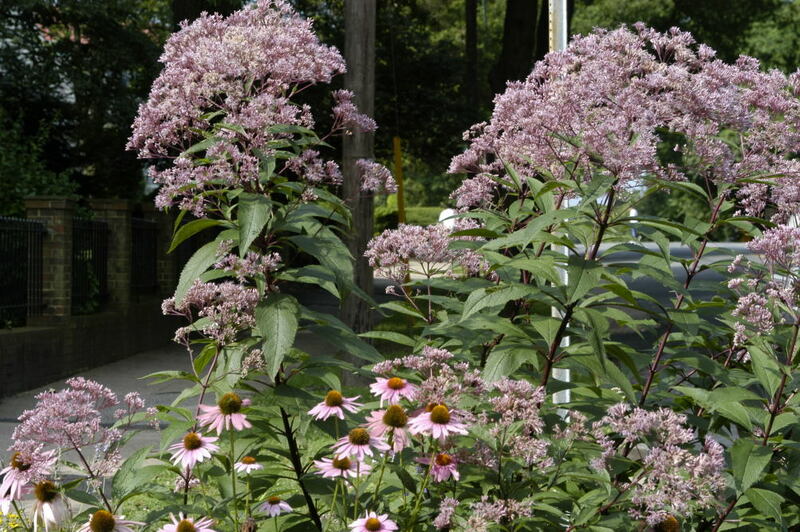 The garden’s owner is a landscape designer who is a partner in European Garden Design, and her garden is a marvel. 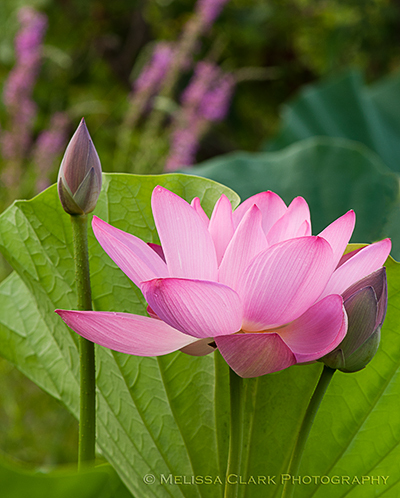 Watch this space in early September for a further sneak peak at it, and in the meantime I hope you’ve enjoyed these views of the luminous lotus.